December 31, 2011 — If you visit Richmond only to see the Edgar Allan Poe Museum (see Part 1 here), people will probably make fun of you. After all, Richmond holds a variety of historical and cultural wonders worth checking in on Facebook at. Not me, though. If you leave Richmond having only seen Poe’s stockings, it’s a successful trip, in my obnoxious opinion. But if you need an excuse to see the rest of Richmond while you’re in town, Poe can do that for you, too. I've seen most of the Poe-related sites in New York, Boston, and Baltimore, but none of those cities by themselves have the depth and breadth that Richmond has. For instance, besides the already mentioned museum, Poe also has a statue in town, which, while not as artistically impressive as the Moses Ezekiel statue in Baltimore, is placed in a much more prominent place…right on the grounds of the State Capitol Building. 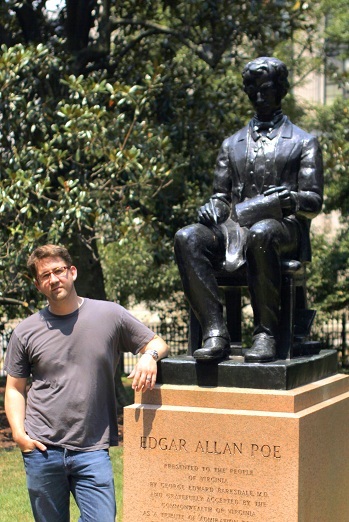 The bronze statue of Poe was created in the mid-1950s by sculptor Charles Rudy at the funding of a doctor named George Edward Barksdale, who then gave it to the “people of Virginia,” according to the inscription on its pink granite base. There was no mention on the monument of a tax write-off. The sculpture is about five feet tall (the base adds another four feet) and depicts Poe in a seated position, with a manuscript in one hand and a quill in the other. However, because of the somewhat odd angle of the neck and hands, it almost looks more like the statue of a lifeless Poe marionette than of Poe himself. Actually, that might make it more worth seeing. You can find it in the southwest corner of Capitol Square, near the intersection of 9th and Franklin Streets, within eye- and ear-shot of the ceremonial, uh, tintinnabulation of Richmond’s almost 190-year-old Bell Tower, which these days is a visitor welcome center. Poe had multiple homes in Richmond, all of which have been demolished over time, unfortunately. However, just like Boston…which made the same mistake…they did put up a plaque near the location of his boyhood home. 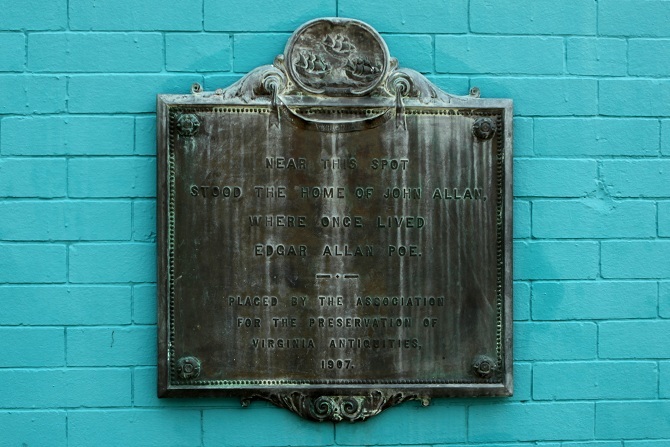 The plaque that denotes the Allan residence is located at the intersection of 5th and Main Streets on the side of a turquoise-painted brick building. Like just about every plaque in the world, it’s anticlimactic, but it does have the three-lettered surname on it that validates its existence more than yours or mine. Richmond was able to preserve at least one important residence connected to Poe. 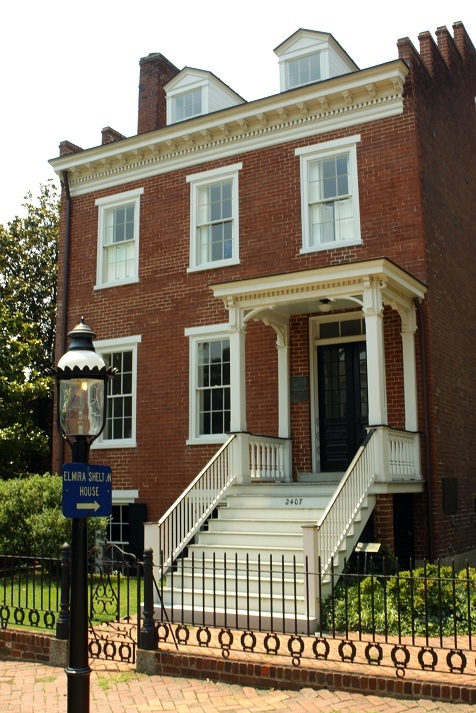 At 2407 East Grace Street is the 170-year-old brick house that was once the home of Elmira Shelton, who was engaged to Poe not once, but twice in their lives, when he was 17 and again when he was 40. The first one was broken off by her father while Poe was in college at the University of Virginia. The second one was broken off by Death himself during Poe’s mysterious last hours in Baltimore. Finally, even though they don't have the body of Poe like Baltimore does, they do have plenty of other corpses worth a Poe pilgrimage. 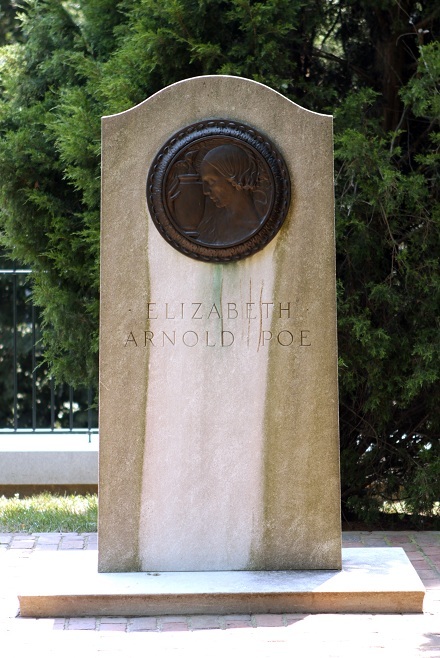 The grave of his birth mother, Elizabeth Arnold Poe, who died in Richmond, is in the churchyard of St. John’s Church at 2401 East Broad Street. This is the church famous in U.S. history for being the location of Patrick Henry’s “Give Me Liberty or Give Me Death” speech. As we all know, he eventually got both. The large monument marking her grave is easy to see in the small churchyard, up against one of the walls. It’s a tall, light-colored slab of carved stone with a large bronze medallion at the top bearing the image of a woman with an urn, out of which pops, naturally, a raven. On the back, another large bronze medallion includes a long quote from a work of Poe’s theater criticism, where he boasts about being the son of an actress whose short career was one of “genius and beauty.” The monument was installed more than a century after her death over what was then her unmarked remains. The rest of the graves Poe would have visited in his life are located in a single graveyard called Shockoe Hill Cemetery. Established in 1822 and spanning a small 12.7 acres, the cemetery’s greatest claim to fame is being the resting place for Chief Justice John Marshall. Of more interest to the likes of us, though, are the graves of Poe’s foster parents John and Frances Allan. They’re buried right on the path behind the easy-to-spot, gated Marshall plot. 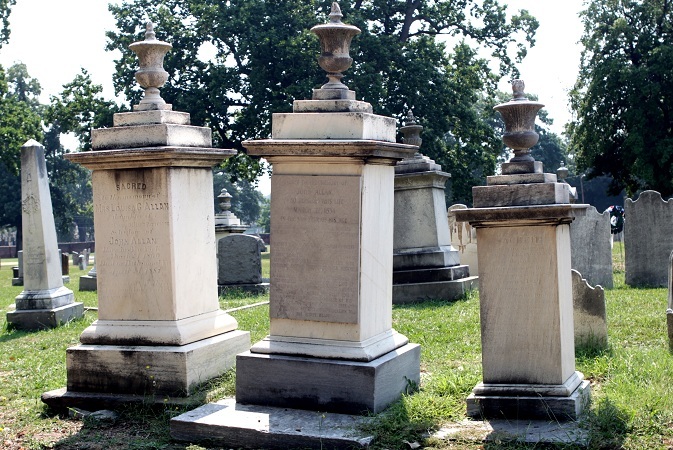 John’s grave is marked by a tall pillar and flanked by two shorter ones, one for Frances and the other for his second wife, Louisa. It’s a strange feeling seeing John Allan’s gravestone. In many ways he was the villain of Poe’s story, the wealthy patron so incensed by the way his ward turned out that he left nothing for Poe in his will, although he did leave money for an illegitimate child few knew about. In fact, standing there, it’s hard to know which side to come down on, reverence or vandalism. After all, it’s either because of this guy that we have Poe’s tormented genius or because of this guy that we don’t have more of it. Elsewhere in the cemetery, and of less mixed feelings, are two of Poe’s muses. The first is Elmira herself. 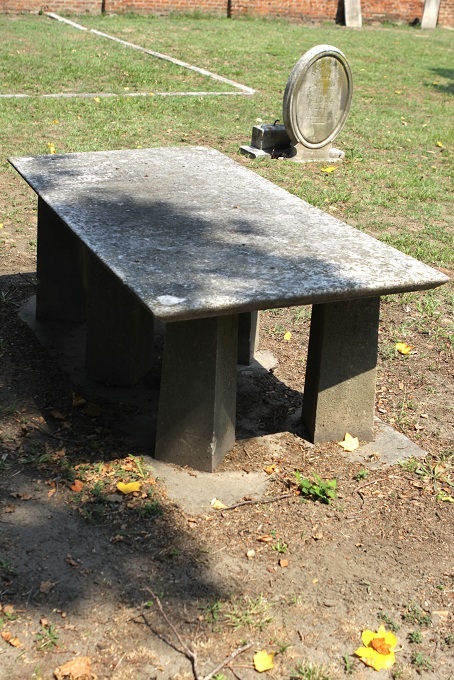 Her grave is in the north corner of the cemetery and is marked by a table-type monument, the engraving on which has worn away to almost nothing so that you really have to know what you’re looking for to find it. Better labeled is the tall, urn-topped grave of Jane Stanard, for whom Poe wrote his famous poem, To Helen. She was the mother of a friend of his who encouraged him as a young teenager in his literary pursuits. She died at the age of 28, not long after meeting him. A plaque at the base of the memorial acknowledges her status as Poe’s Helen, and goes on to quote his The Valley Nis, which features a character, or at least the grave of a character, named Helen. 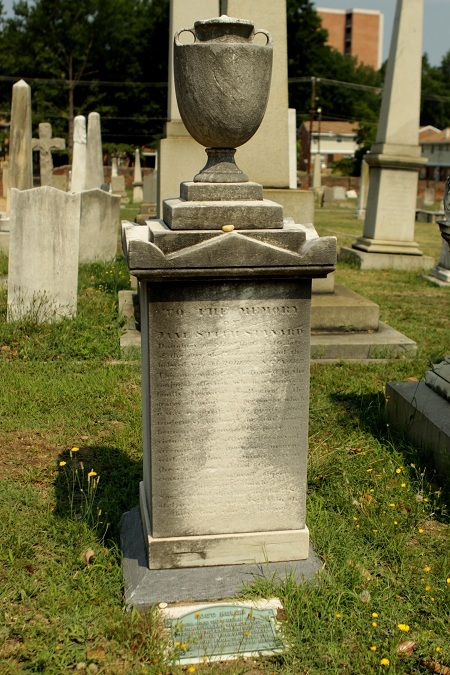 Shockoe Hill Cemetery is located at the intersection of 2nd and Hospital Streets, and judging by its Facebook page, there’s a pretty active community around it…small and humble though it is. In fact, when I visited, there was a map posted showing all the graves of note on the premises, without which my visit would have been a failure in a life so full of them I’ve had to lobby Webster’s to change the definition. So sincere thanks for that, Shockoe people. 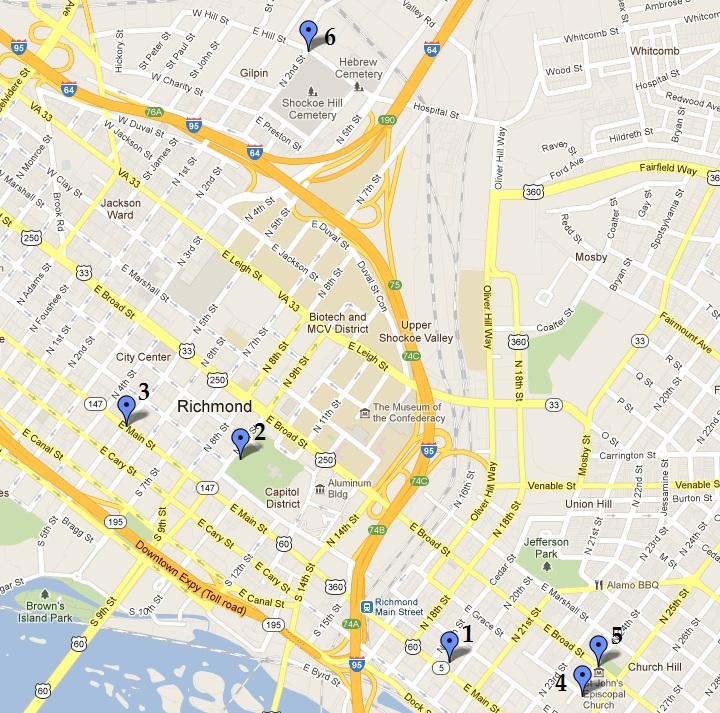 Here’s a Google map of Poe’s Richmond that I put together for you (click on it for a larger size). For reference, the legend is below and the distance between Site 1 and site 3 is 0.9 miles. Probably shouldn't get used to this level of helpfulness from this site, though. I'm just feeling all for auld lang syne-ish.